The MTQ All Star page has recognized several businesses for their commitment to veterans. It would seem that similar praise would be in order for the VA based on the announcement by VA Secretary Shinseki to increase the percentage of veterans in the VA to 40%. It was then somewhat disheartening to see a complete lack of acknowledgement of this goal in the VA's Office of Diversity and Inclusion (ODI) Strategic Plan for FY 2012-2016. As the ODI Strategic Plan reflects, the VA's inclusion goals are based on what the strategic plan refers to as the Relevant Civilian Labor Force (RCLF). Allegedly this reflects a cross-section of the population who are available for employment. This quip is not intended to disparage the good work of the VA, but rather is an illustration of the dangers of interpretation of data. 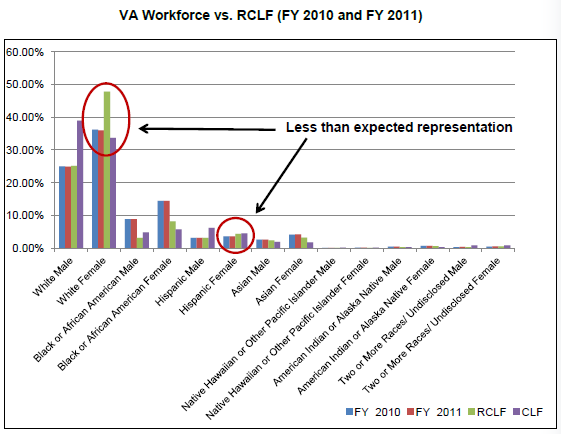 One of the most striking illustrations (copy extracted above from the ODI document) is the indication that the RCLF would suggest that almost 50% of the RCLF is white women while the VA workforce is at a mere 36% prompting ODI to identify multiple strategies and goals to ensure there are no barriers for this group. Intuitively, one would have to wonder whether a workforce of 50% white females (leaving the other 50% to non-white females and males) is desirable let alone desirable in a workforce that is targeting a workforce where 40% are Veterans. On the surface alone, I think we should be suspect of blindly mapping to data that implies that 50% of a workforce should consist of a single specific demographic. (After all, isn't the "D" in ODI for "diversity"?) I wonder if the RCLF suggested that 50% of the workforce should be white males if that be would be accepted at face value? While I realize the fastest growing demographic of the military is female, I would be shocked to learn that the military consists of almost 50% white females (it doesn't). (What we don't recruit for our armed services using the RCLF?...maybe we should). While efforts for inclusion should be applauded, one has to wonder whether applying the RCLF is the most appropriate measure for an organization targeting a sizable veteran workforce. After all, as this quip will reflect, the demographics of our veteran population is much different than the demographic composite of the RCLF. Just for fun, MTQ went to a VA website to take a peak at Veteran demographic data and looked at the spreadsheet relating to race which also includes gender. In particular, I examined the row for the 9/30/2012 estimate on the provided timeline. First, I looked at the total male to female numbers for 9/30/12 which reflect approximately 20,079,700 males and 2,248,579 female. Clearly there are far more males in the military in the military than females (roughly 90% male; 10% female) so one would have to suspect that if your organizational goal is for 40% veterans, then much of that 40% would turn out to be male. Next, I examined the numbers for "white only, not Hispanic" and "black only, not Hispanic" in the 9/30/2012 timeline to yield the data in the table below. As expected, when looking at veteran demographics, "white women" are clearly small in number which would certainly cause pause to wonder why an organization striving for a workforce of 40% veterans would think that achieving a RCLF level of almost 50% white women would be a good thing. It would seem that the greatest barrier to hiring more white women is the VA's own goal to increase its workforce to 40% veterans. An honest accounting of diversity in the VA must consider both RCLF data and veteran data. A sensible first step might be to pull veteran employee data apart from non-veteran employee data. Then it would be interesting to see how non-Veteran employee data compares to RCLF data. This might suggest entirely different demographic groups are actually under-represented in the employee mix at VA. Who knows, maybe what the VA needs to do is remove barriers for males? Bonus quip - for those intrigued by numbers, it is interesting to examine the ratio of White Female/Total White (about 8.5%) versus Black Female/Total Black (about 17.1%) - over double...maybe those white women in the RCLF are doing so well that they don't need to consider military service? Who knows maybe reading Freakonomics is paying off?